Those are big chess set which stand on a wide board. 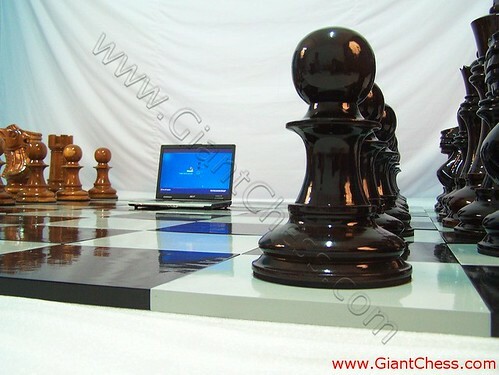 The black and brown chess pieces have designed in big enough size and polish with glossy touch, make it looks simple but elegant. Those are made from best Teak wood material and carved in high quality product by professional craftsman. So unique and beautiful. Perfect for you who loves chess game, so you can get it one set for your collection. You just need flat area and put the table on it. Those are big chess set that very durable for outdoor and indoor use, because it has made of best Teak wood material from Java Island. So you do not need worry about its quality because we choose the best wood that has dried before. Enjoy your chess game whereever you want using this kind of chess set.